San Diego English Country Dancers (SDECD) is a 501(c)(7) nonprofit organization that provides avid English country dancers in San Diego and surrounding areas with opportunities and a venue to partake of this lovely form of dance. SDECD was founded in October 2000 by Ellen Riley, an English country enthusiast who moved to San Diego from Philadelphia in the early 1980s. In San Diego she found the outlets for fulfilling her passion to be rather wanting; she actually practiced ECD figures by spreading towels on the floors and using them as surrogate partners! Soon enough, and eager to find like-minded, flesh-and-blood beings to dance with, Ellen founded this organization, and began holding weekly dances in a studio on Oak Knolls Road in Poway. 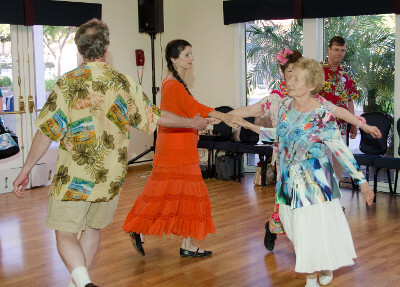 Since that time, SDECD has grown to over 80 regular members, and has relocated to a larger dance floor at Rancho Bernardo Swim and Tennis Club. SDECD regularly draws people from as far north as Carlsbad, and as far south as Chula Vista. It also claims its share of out-of-town dancers and dance callers too. From SDECD there also sprang the San Diego May Faire Ball, an annual event held in the month of May since 2008, giving English country dance enthusiasts from all over California and surrounding areas an opportunity to congregate and share in the dance. In October 2015 San Diego English Country Dancers enjoyed its 15th anniversary, and celebrated in part with this new website. We hope you will enjoy taking the virtual tour online, and that it spurs you to become an active member of the group! 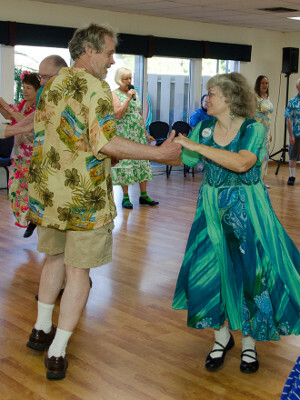 Read about our Sunday night dances just below, and be sure to visit our Upcoming Events page for noteworthy English Country dance events in San Diego and elsewhere. Fear not, gentle reader, if you are a dance novice, for SDECD welcomes beginning dancers with open arms. If you are an absolute newcomer to ECD, a good place to begin would be the section titled What Is English Country Dance? Our weekly dance event takes place every Sunday evening from 6 to 9 p.m. on the dance floor of Rancho Bernardo Swim and Tennis Club, located at 16955 Bernardo Oaks Drive. Doors open at 5:45 p.m., dancing starts at 6, and we usually break for refreshments around 7:30. Here is our dance flier. We hope to see you this coming Sunday! Our Beginners' Session starts promptly at 6 p.m. If it's your first time, or you need extra practice, please arrive right at 6 p.m. or just before, because we always start with the easiest dances. At this time all the figures and patterns are taught, and all the dances are walked through several times before we dance them with the music. You will learn several dance figures along the way, including heys, turn singles, casting, pousettes, and more; experienced dancers are always available to help. Please wear comfortable, low-heeled shoes. Special discount for beginners: when you pay for your first dance with us, you will receive a coupon for attending your second dance free of charge! Please note: We have some members who are sensitive to heavy fragrances. In consideration of our members, please refrain from using strong-smelling perfumes, colognes, and aftershaves when preparing for the dance. We welcome the assistance of volunteers during our Sunday night dances, particularly in the area of setting up sound equipment for the caller (and musicians where applicable), and dismantling and storing that equipment afterward. Assistance in setting up refreshments for the break is also appreciated. If you are particularly adept at cooking and baking, we'd love it if you donated some homemade goodies for the break. It's a great way to show off your culinary prowess! The SDECD Board is the group that makes things happen: they are responsible for planning and organizing; administration and finances; advertising and publicity; insurance and legal issues; booking guest callers and musicians; updating the website; and other behind-the-scenes activities to keep the regular Sunday dance and special events going throughout the year. Our current board members are Jimmy Akin, President; Douglas Nicoll, Vice President; Martha Wild, Secretary; Bob Griffin, Treasurer; and Susan Moffatt, member-at-large. There is one vacant member-at-large position; interested persons should contact the Board. All dancers are invited to come and participate in our board meetings, but if you are not a board member, please contact our president at least a few days in advance of the meeting. See the Contact Information section of this website to get in touch with members of our Board. For a list of SDECD board members in prior years, please refer to this document. We would like to thank and acknowledge, first and foremost, Bob Green, and several other individuals associated with Childgrove Country Dancers and other organizations, for their generous permission to display their English country dance videos in many places on our new Dance Repertoire page. (The new page displays these videos in a larger, more accessible format than before.) Thanks also to English country dancer David Jacobson for taking time out from the dance to obtain some great photos of our Sunday-evening dances. Credit is also due to Icon Archive for offering remarkable icons that are in the public domain, and available for commercial use as well. Our database of dances called by SDECD historically could not be improved without the assistance of key individuals who are very knowledgable about English country dance, and who have the reference works to cite primary sources of information as appropriate. Several of our own callers participated in this effort, but the lion's share of the work has been accomplished by Sharon Green. SDECD owes her a huge debt of gratitude for her willingness to help with this enormous project. Lastly, many, many thanks to Gordon Dodge of Boise English Country Dancers for granting permission to use information gleaned from his own database containing nearly 600 dances called within his group. In so doing we were able to incorporate at least one datum from each of nearly 290 dances called by both groups historically, and that enabled us to fortify our own database very quickly. We look forward to seeing what Gordon has in store as he updates his database with new information!